With the sunlight beaming down the wooded area and Tchaikovsky-like music playing, the U of L Dance Academy’s performance opened like a fairytale. 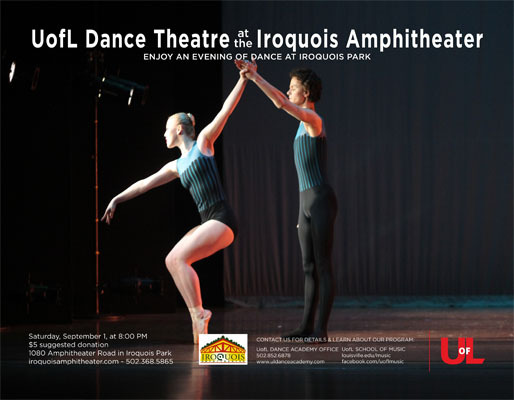 Every year, The U of L Dance Academy provides an opportunity for students, level VI and up, to demonstrate their abilities to the public at the Iroquois Amphitheater for free. “We have been fortunate enough to perform here for the past several years, and gracious that Iroquois is letting us perform here on Labor Day weekend. We try to represent what the dance academy offers: some modern dance and classical ballet,” Dance Academy choreographer Chuck Bronson said. For Saturday’s performance, dances ranged from ballet pieces such as “Peasant Pas from Giselle,” to contemporary illustrations such as a dance to a remix of “Unsteady” by the Ambassadors. “Iroquois is my favorite performance because it’s not often as a dancer you get the opportunity to perform on such a big stage with a full lighting and sound crew. The Iroquois staff is wonderful to work with,” dancer Jacob Litchtefeld said.